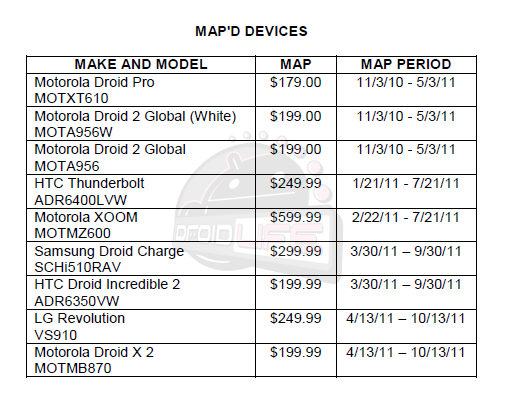 The DROIDX2 and LG Revolution have been MAP’d! That’s minimum advertised price for those new to this game. Basically, this is the minimum price that anyone is allowed to advertise these products at when they launch, but is not necessarily a sign of what you’ll pay at the register. Remember that Verizon is now allowed to toss out instant discounts in some cases instead of making you deal with those pesky little rebates that used to drive us all nuts. Oh, and the dates up there are not release dates, but the period of time that the MAP must be honored. A device landing on this list is usually a pretty good sign that it’ll be here soon though. The DROID Charge and Incredible 2 should look familiar since we first reported on their MAPs just a few weeks ago. For Samsung’s sake, they better hope that $299 is the biggest misprint in the history of MAP’d sheets or they better surprise us with a dual-core.